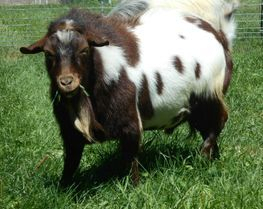 Since 2001 we have raised quality registered fainting (myotonic) goats for pets, breeding, and showing. We expect our goats to do well with moderate input. We do not creep feed/free feed. As a result, our goats grow more slowly. In general, they are smaller than the style of goats currently winning shows. Disease testing info: Our latest round of testing for Johne's disease, CL, and CAE was done in May of 2018. Every goat over 18 months old was tested and all were negative for all three diseases. Email us by clicking here: Pine Acres email. Or call 612-390-1585. 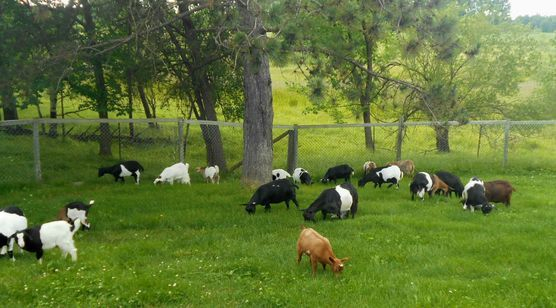 Our goats feature good muscling, wide and deep bodies, good udders, low maintenance feet, superb maternal instincts, parasite tolerance, and great personalities. We strive to raise solidly built, medium-size goats. To us, medium-sized is mature does in the 90-110 lb range and bucks in the 150-175 lb range. 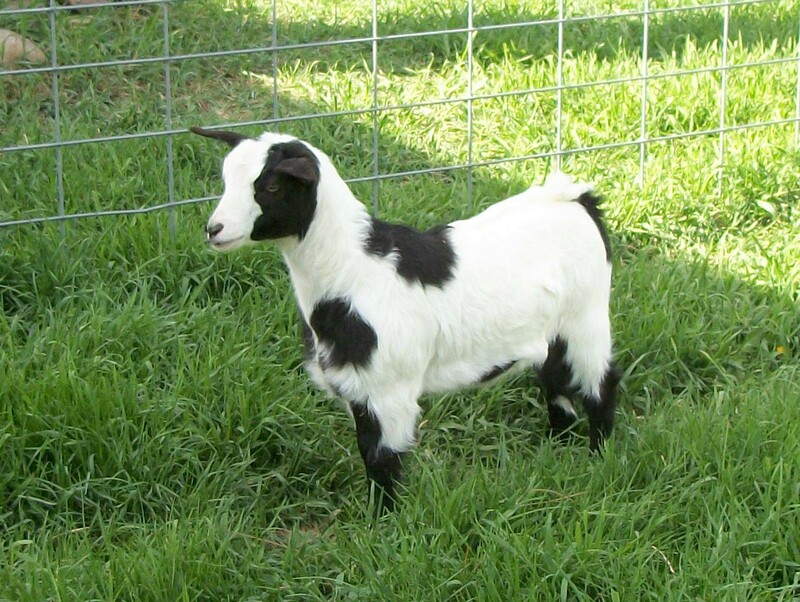 Since 2001, 100% purebred, registered myotonic goats are all we've raised. They're healthy, happy and well-bred. August, 2017. 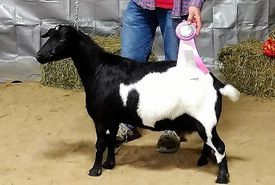 One of our favorite goats, Raven's Rest Odessy, won Grand Champion Doe in show B at Princeton, MN. We purchased Odessy from Terri Lenoci in Florida in 2015. We're proud to have her here! September, 2017. 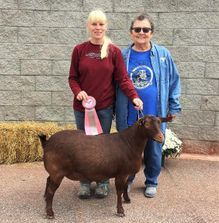 Pine Acres Scarlett, now owned by Jan Likens and shown by Melissa Likens, won her second point in Franklin, IN. One more win and she's a Permanent Grand Champion! In 2005 we realized that we had several goats with CL (caseous lymphadenitis). We culled all goats and started over on a "clean" portion of our property. There hasn't been an abcess on a goat since. We have tested extensively for CL, CAE and Johne's disease since 2005. None of our goats has ever tested positive for any of these diseases. At this time we feel we are at very low risk for infection by any of these three diseases. Our latest testing was in May, 2018. ©2005-2019 Pine Acres Farm. All content on this site, including photos and text, was created by us. It belongs to us and may not be used elsewhere without express permission.